The Leia Display system is a large-sized display technology that uses images projected upon a fine mist. See the theatrical effects that are possible in the video below. This unique technology makes possible to walk through the image, touch it or interact with it. Streams of barely visible fog becomes an image carrier and their laminar structure allows to display hi resolution contents. Our patented way to produce laminar airflow for very long distance from the output makes Leia Display the most steady mid-air screen on the market. Leia S-95 is tv sized and blows a mist bottom-up. It’s a perfect solution for showing things. You can display a virtual assistant, 3D model or a game. Best for premieres, fairs, museums, promotions and control panels. The screen is fully interactive thanks to our software. It also supports very precise mid-air signature with Leap Motion technology. Leia X-300 is hanged from the top and blows a mist top-down. It’s an only 3 meter screen you can literally walk through. Nothing lies on the ground so your path in clear. 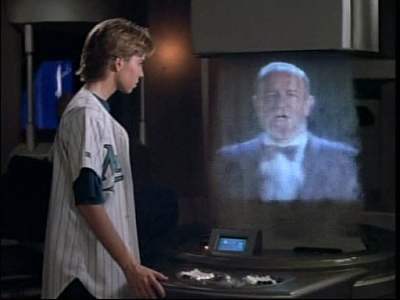 You can welcome your guests as an holographic video at the entrance or drive out of the screen braking the virtual pane of glass. This screen has a really infinite number of applications. It can be turned into a giant touchscreen allowing to play your favourite game. Your body can also be tracked and let you shoot fire balls or dance with music visalisation. Fans of the 1993-96 series SeaQuest DSV recall the tabletop display that Captain Bridger (played by Roy Scheider) had in his cabin. Fans of John Varley might also recall the ghostsmoke advertising display from his 1977 novel The Ophiuchi Hotline. Lilo and Vaffa moved through a maze of floating advertisements of ghostsmoke and holomist that followed the prospective customer and played breath-catching tricks with perspective, all the time broadcasting direct to the inner ear, thus evading the noise-pollution laws. One assumes that the name "Leia Display" is a reference to the Princess Leia hologram from the original Star Wars film.